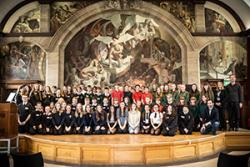 Around 150 pupils aged 13-14 visited Bangor University recently in order to receive awards at the end of their participation in the Modern Foreign Language Student Mentoring Scheme, which introduces school pupils to the value of studying foreign languages, before they make their GCSE subject choices. The North Wales School Effectiveness and Improvement Service (GwE), Bangor School of Modern Languages and Cultures, Bangor Confucius Institute, the Centre for Galician Studies in Wales and the North Wales Deaf Association delivered a series of motivational speeches and taster sessions in Mandarin, Galician and Sign Language. Launched in 2015 by the Welsh Government to combat the ‘serious decline’ in the take up of modern foreign languages by school pupils in Wales, the Scheme has grown in popularity with a total of eleven North Wales schools (Holyhead, Dyffryn Ogwen, Rhyl, Tryfan, Syr Thomas Jones, David Hughes, Emrys ap Iwan, St Brigid’s, Argoed, Friars, y Creuddyn) taking part. The modern language based activities are organised and delivered by a Bangor University student who has been trained as a mentor and partnered with pupils at each school, to undertake weekly small- group activities with the children. "The scheme has been incredibly rewarding, not only in terms of being able to share my experiences with the mentees, but also seeing them start to explore avenues they might not have before. My sessions have been full of students exclaiming: “I didn’t know you needed Languages for that job!” And I’m over the moon that following the project, 15 of my students have decided to continue with MFL at GCSE level – the highest number the school has ever had!" Pupils involved in the scheme have attended sessions with their undergraduate mentors designed to highlight the benefits of learning modern languages and the career opportunities they bring. The mentoring scheme, which is part of Welsh Government’s Global Futures strategy, has seen the language departments of Cardiff, Swansea, Bangor and Aberystwyth universities work together to train undergraduates to become mentors for pupils in local secondary schools. Evidence from mentors and mentees thus far suggests a very positive student experience and increased aspiration to take languages at GCSE. The scheme builds on existing work taking place between universities and schools in Wales, including the Routes into Languages Cymru programme, through which universities engage in outreach programmes with pupils in local primary and secondary schools. As well as creating sustainable links between HE modern foreign language departments and secondary schools, the scheme will offer employability experiences and opportunities to modern linguist undergraduates.